We've had so many major dramas, I feel like events that would be permanently ingrained in the brains of other fan bases could easily be forgotten here. Let's revisit some, shall we? Can be good or bad, on the field or off. I'll start. Remember that time when we were down by 7 against the Bucs, scored on 5th down with less than 10 seconds left, then botched the extra point? So many options to choose from....I’ll choose this one only because it’s probably my favorite game I ever attended live. The energy was INSANE in FedEx that night. 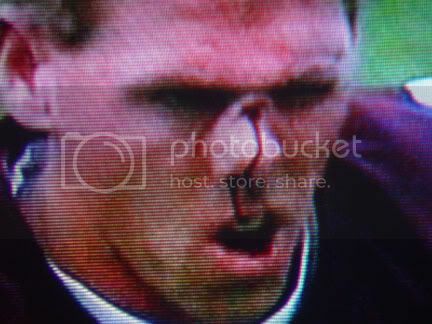 remember that time Bryan Barker broke his nose on Thanksgiving and made 30 million people simultaneously lose their turkey dinners? First, thanks for accepting me. Second, remember this because it was a school night and my parents let me stay up. That was a great game. I remember sitting in my dorm room on Long Island with three friends that night (2 of them giants fans, 1 of them a redskins fan) watching the game. It got pretty heated in there a few times ?? I haven't actually watched this since I was 8-years-old. But I remember. My God, do I remember. What a ****ing choke job. Boomer Esiason throwing for 500 ****ing yards. Remember that time I started a topic just like this not too long ago.. Remember that game in 1999 when Tim Biakabutuka ran for like 7 trillion yards and 2-3 TDs in the first quarter against us but we somehow came back to win a crazy game thanks to 1) the Panthers having a RB rotation, 2) Brad Johnson hitting our WRs deep a bunch of times, and 3) Conway hitting a long kick. I remember we had essentially battled all the way back from a 21-0 deficit by halftime but then blew an 11-point lead to be down one in the final minutes before Conway's game-winner. That season was full of roller coaster games! Albert Connell had 15 touchdowns in his career, and I think they all came in, like, two games. In 1983 even though we were 13-2 going into the last game, we did not technically win the division until the last game. Apparently I was suppose to post something depressing. Yeah, we played the Bucs twice in three weeks during the latter stages of the 1994 season. That was before the league realignment in 2002 when the schedules got more predictable. We also had two bye weeks during the excruciating 1993 season........as if having to endure the actual games that year was bad enough. Someone mentioned the 1999 game against the Panthers and that one stands out as one of those fun games early in the history of JKC Stadium/Redskins Stadium/FedEx Field when the place isn't as maligned as it is now from all the losing, the disfiguration of the upper deck, dream seats, etc. Remember sitting in the lower bowl and the band sat in the stands on the opposite end of the field (but along the sidelines) and seemed like they were jamming after every play. Don't know if others remember that, but it was really cool, particularly as the Skins were coming back in the second quarter from that early deficit. Nah, it can be good or bad. Most of them are going to be bad because, you know... Redskins. Well, you'd probably have to go back sometime to remember when something positive happened. Loss to Dallas in 1979. Until the final 140 seconds, the Redskins were on the verge of winning the NFC East title. Two Staubach touchdown passes, one with 2:20 to play, the last with 39 seconds left, brought the world crashing around their heads. It also allowed the Chicago Bears to gain a wild-card berth on the basis of a four-point edge in point differential. In a game that had the Washington Redskins racing home to their VCRs, the Philadelphia Eagles scooped up Gerald Riggs's fumble in the final 76 seconds, used a controversial exchange to advance it 77 yards and won, 42-37, yesterday in front of a mortified RFK Stadium crowd. That was the loss that kept us out of the playoffs, IMO. I'll agree about the Boomer Esiason one. Even now if you throw more than 50 times in a game, no QB is likely to win. Along with being -3 in the turnover area and your opponent has a 200+ yard rushing day with 3 TDs. Another surreal event was the Warrick Dunn fumble recovery by the Bucs in that playoff game. Darryl Grant's tipped interception vs Cowboys in 1983 NFCCG. For the 1989 loss to the Eagles.....the article states that Riggs broke a long run down to the Philly 22 before the madness ensued. I often have wondered if the Skins could've just taken a knee to preserve the win instead of trying to run the ball. Anyone remember the specifics? You are probably right. It was 3-10 with 1:19 so the play was a give up anyway and the Eagles had no time outs. I bet you could have gotten it down to at least 40 seconds until you had to snap the ball or take the delay of game on a 4th down kneel down which burns another few seconds. If you think your defense will give up a 70+, 40 second drive to a team with no timeouts, you definitely have no confidence in your defense. In any case, Rypien is not a small guy and knew how to milk taking the knee plays for the longest possible time. Remember when it never occurred to you that Colt McCoy would be the only guy in this photo still here? Where’d you find the link for that photo?